A vintage sterling silver hand engraved oval 1-1/2" x 1" (sans bale) photo locket on an 18" link chain with a springring clasp. This 1930s-40s necklace weighs 11.8 grams and it is engraved on one side only. 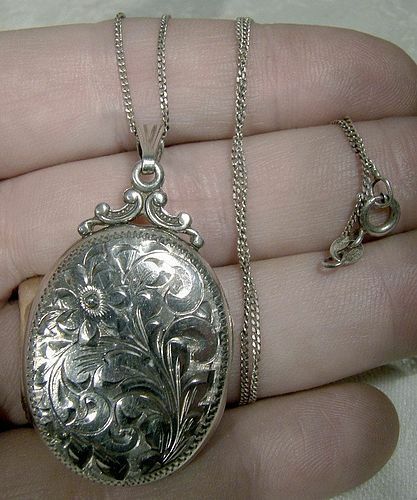 The locket is stamped BIRKS STERLING, it has two photo retaining bezels and it is in excellent vintage condition with no dents, bends, corrosion, losses, damage or repairs. All items are thoroughly and conservatively graded and all condition issues are noted; all items are vintage or antique and may have slight signs of gentle use. Tracked Packet shipping to the U.S. starts at $13.50 - this includes online tracking, air service and insurance up to $70. Items paid with a credit card will be shipped to confirmed addresses only. We do ship internationally. All of our prices are in $US. PLEASE NOTE: We DO NOT accept PayPal. A post Edwardian diamonds row engagement ring in 14k yellow and white gold circa 1910-15. 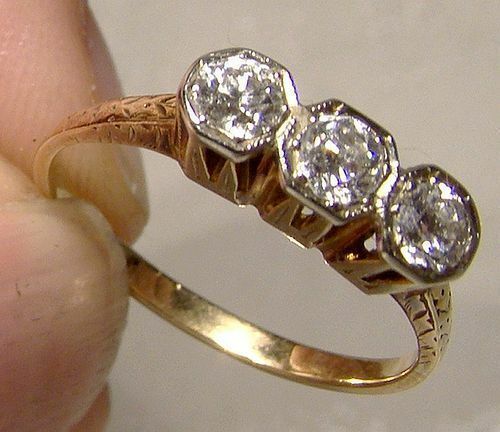 This antique size 6-3/4 ring features three European cut diamonds (42 points total, SI1-2, G-H colour). 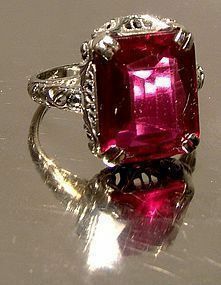 Three stone rings became popular in the late 1900s, especially for engagement rings. The 3 stones in a row signified the phrase I Love You or Be My Bride. It weighs 2.4 grams and it has a recent gemological independent conservative appraisal in the amount of $1350 Canadian (~$1040 US). It is in very good condition with no chips, cracks, dents, bends, corrosion, losses, damage or repairs. All items are thoroughly and conservatively graded and all condition issues are noted; all items are vintage or antique and may have slight signs of gentle use. Expedited tracked and insured parcel shipping to the U.S. starts at $27 (other spots may vary, air is higher). Items paid with a credit card will be shipped to confirmed addresses only. We do ship internationally. All of our prices are in $US. PLEASE NOTE: We DO NOT accept PayPal. 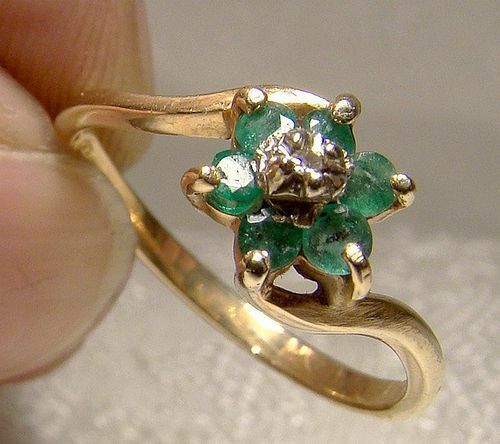 A 10k yellow gold ring set with six genuine emeralds (3 point by gauge) surrounding a single point central diamond circa 1960s. This sweet vintage size 6-1/2 or 6.5 ring measures 1/4" across the setting and it weighs 1.8 grams. It is stamped 10K with an obscured maker's mark and it is in excellent condition with no chips, cracks, dents, bends, corrosion, losses, damage or repairs. Great gift for your May birthday sweetheart child or grandchild. All items are thoroughly and conservatively graded and all condition issues are noted; all items are vintage or antique and may have slight signs of gentle use. Tracked Packet shipping to the U.S. starts at $14.50 - this includes online tracking, air service and insurance up to $70. Items paid with a credit card will be shipped to confirmed addresses only. We do ship internationally. All of our prices are in $US. PLEASE NOTE: We DO NOT accept PayPal. 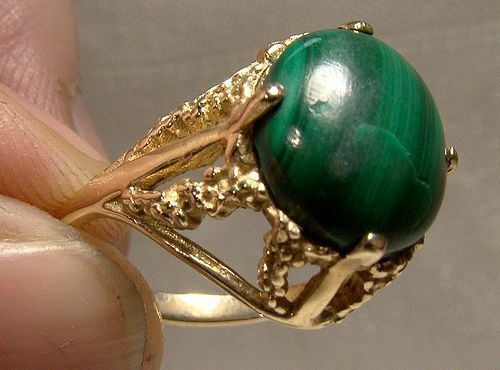 A 10k yellow gold natural green striped malachite cabochon ring with a pleasant naturalistic setting from the 1960s. This size 6 ring measures 5/8" across the setting and it weighs 4.2 grams. It is stamped 10K with a V in a D maker's mark and it is in excellent condition with no chips, cracks, dents, bends, corrosion, losses, damage or repairs, however there is a natural internal cleave and a couple of small scrapes to the stone. All items are thoroughly and conservatively graded and all condition issues are noted; all items are vintage or antique and may have slight signs of gentle use. Expedited tracked and insured parcel shipping to the U.S. starts at $21 (other spots may vary, air is higher). Items paid with a credit card will be shipped to confirmed addresses only. We do ship internationally. All of our prices are in $US. PLEASE NOTE: We DO NOT accept PayPal. 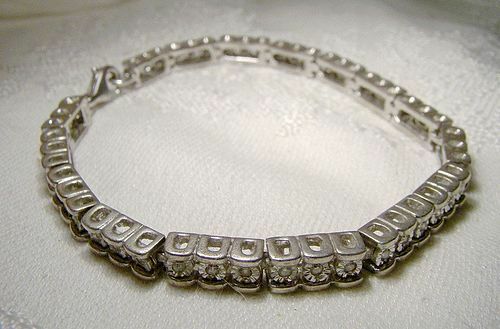 A sterling silver tennis bracelet with genuine diamonds from the 1980s. This vintage tennis bracelet measures 7-3/8" long and 3/16" wide. It has a lobster claw clasp and it is stamped 925 SC. It weighs 16.6 grams and the 48 diamonds average ~2 points each (almost a carat in total). The diamonds are set in round star-designed bezels which makes them appear quite large, and this bracelet would make a great gift. It is in excellent condition with no chips, cracks, dents, bends, corrosion, losses, damage or repairs. This item is in excellent condition with no chips, cracks, dents, bends, corrosion, losses, damage or repairs. All items are thoroughly and conservatively graded and all condition issues are noted; all items are vintage or antique and may have slight signs of gentle use. Expedited tracked and insured parcel shipping to the U.S. starts at $22 (other spots may vary, air is higher). Items paid with a credit card will be shipped to confirmed addresses only. We do ship internationally. All of our prices are in $US. PLEASE NOTE: We DO NOT accept PayPal. 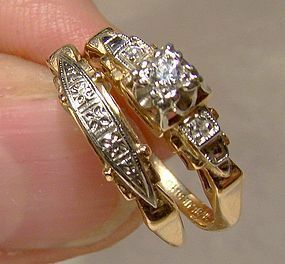 A vintage 1930s genuine Art Deco period matching pair of engagement diamond rings in 14-18K yellow gold. This set features a classy design and the 18K white gold top sets off the diamonds nicely. This set is stamped 14-18K BLUEBIRD and it weighs 3.8 grams. The size 5-1/4 band has a decorated white gold top with no diamonds, and the size 5-1/2 engagement ring features a central 10 point (by gauge) diamond with two small flanking diamonds. It also has a K5458 pattern number and it has been reshanked in the past. It measures 5/8 x 3/16" across the setting and this set is in excellent condition with no chips, cracks, dents, bends, corrosion, losses, damage or repairs. All items are thoroughly and conservatively graded and all condition issues are noted; all items are vintage or antique and may have slight signs of gentle use. Expedited tracked and insured parcel shipping to the U.S. starts at $25 (other spots may vary, air is higher). Items paid with a credit card will be shipped to confirmed addresses only. We do ship internationally. All of our prices are in $US. PLEASE NOTE: We DO NOT accept PayPal. A Salt City Diamond Syracuse ginger beer bottle. 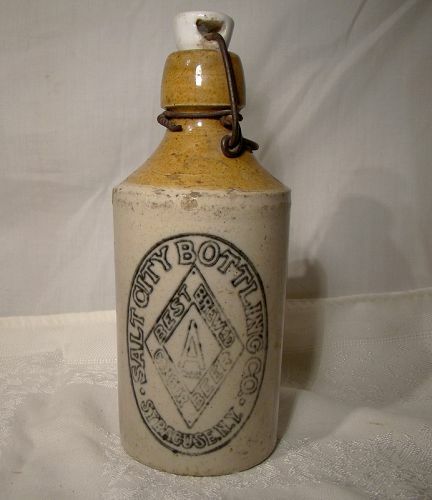 This 7-3/8" bottle is from the Salt City Bottling Co. of Syracuse, New York retains the original lever cage and white Diamond Ginger Beer stopper, which is often missing. This item is in very good original condition with no cracks, crazing, losses, damage or repairs other than some minor rusting to the wire cage, a chip to the underside of the stopper at the wire, two old glaze flakes to the shoulder (possibly original) and two chips to the bottom rim. All items are thoroughly and conservatively graded and all condition issues are noted; all items are vintage or antique and may have slight signs of gentle use. Tracked Packet shipping to anywhere in the U.S. is $16.00 - this includes online tracking, air service and insurance up to $70. Items paid with a credit card will be shipped to confirmed addresses only. We do ship internationally. All of our prices are in $US. PLEASE NOTE: We DO NOT accept PayPal. An elegant vintage 1-3/8" across gilt sterling circle pin with alternating cultured pearls and round polished natural garnet beads c1940s-50. This pin is made of gilt sterling, and the garnets are 6 mm. across while the pearls are 4 mm. 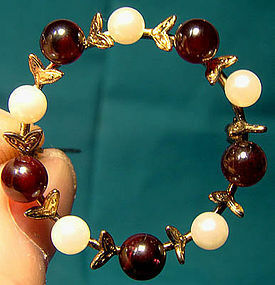 The garnet have a wonderful deep red colour and the well-matched pearls have a great creamy white lustre. There are gilt leaves between each stone, and this pin has a safety catch. It is stamped with a ST with a double capital back-to-back R. It weighs 5.4 grams, and it is in excellent vintage condition with no chips, cracks, dents, bends, corrosion, losses, damage or repairs. All items are thoroughly and conservatively graded and all condition issues are noted; all items are vintage or antique and may have slight signs of gentle use. Tracked air postng to the U.S. starts at $13.50 (other spots may vary). Items paid with a credit card will be shipped to confirmed addresses only. We do ship internationally. All of our prices are in $US. PLEASE NOTE: We DO NOT accept PayPal, only VISA and MASTERCARD. A vintage 1930s fine quality gold filled 1-1/4 x 1-1/8" hand engraved photo locket on a 20-1/4" rope chain with a springring clasp. 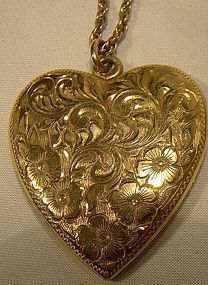 The undecorated back of the locket has never been monogrammed and it has two photo retaining bezels and celluloid windows in the interior. The bezels are stamped J.E.B.CO. and this 1930s necklace is in excellent condition with no dents, bends, corrosion, losses, damage or repairs. All items are thoroughly and conservatively graded and all condition issues are noted; all items are vintage or antique and may have slight signs of gentle use. Small packet air shipping to the U.S. starts at $9.50 (other spots may vary). Items paid with a credit card will be shipped to confirmed addresses only. We do ship internationally. All of our prices are in $US. PLEASE NOTE: We DO NOT accept PayPal, only VISA and MASTERCARD. A fine and decorative late Victorian arrow shaped bar pin with a natural amethyst stone. 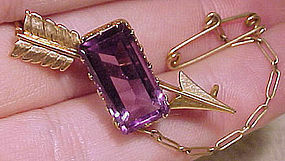 This 1-1/2" long brooch has a claw-set 3/4 x 3/8" faceted amethyst, and the pin has the original c-clasp and an attached safety pin on chain. It is marked 585 (for 14K), it weighs 6.0 grams, and it is in excellent condition with no chips, cracks, dents, bends, corrosion, losses, damage or repairs. All items are thoroughly and conservatively graded and all condition issues are noted; all items are vintage or antique and may have slight signs of gentle use. Expedited tracked and insured parcel shipping to the U.S. starts at $25 (other spots may vary, air is higher). Items paid with a credit card will be shipped to confirmed addresses only. We do ship internationally. All of our prices are in $US. PLEASE NOTE: We DO NOT accept PayPal, only VISA and MASTERCARD. 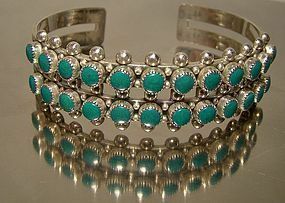 A Zuni sterling silver and turquoise double row cuff bangle bracelet circa 1960s. While we previously attributed this as a Navajo piece based upon what we were told, we have been informed by a thoughtful collector that this is actually a Zuni snake eyes bracelet. This elegant vintage southwest 5/8" wide cuff bangle bracelet measures 2-1/4" x 1-7/8" across the interior. It features a double row of bezel-set turquoise gem stones in a rich blue green or teal color with alternating silver half balls or discs. It is stamped STERLING only, it is not otherwise signed. It weighs 25.5 grams. It was purchased in Arizona in either 1970 or 1971, possibly made then or in the late 1960s. It is in excellent vintage condition with no chips, cracks, dents, bends, corrosion, losses, damage or repairs. All items are thoroughly and conservatively graded and all condition issues are noted; all items are vintage or antique and may have slight signs of gentle use as would be expected. Silver and silver plated items are hand-polished, not buffed, and our halogens and magnified images may exaggerate otherwise barely noticeable scratches and flaws. GUARANTEE: ALL of our items are antique or vintage and from the period listed. NONE are reproductions or recreations. Expedited tracked insured shipping to anywhere in the U.S. starts at $17.50 and expedited shipping within Canada starts at $11. Rates vary by destination, value, size, weight, payment option and shipping method. Other payment, tracking and insurance options are available - please inquire. We ship worldwide - please contact us for an accurate shipping quote with your postal code or country. 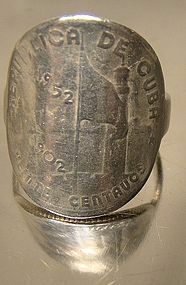 A 900 silver 1952 Cuban 20 centavos coin ring with a 925 sterling silver shank. This size 9-1/4 ring features a genuine coin from 1952 commemorating the 50th year of the republic. This ring weighs 6.7 grams and it is in excellent condition with no dents, bends, corrosion, losses, damage or repairs other than some wear to the coin face. All items are thoroughly and conservatively graded and all condition issues are noted; all items are vintage or antique and may have slight signs of gentle use. Small packet air shipping to the U.S. starts at $9.50 (other spots may vary). Items paid with a credit card will be shipped to confirmed addresses only. We do ship internationally. All of our prices are in $US. PLEASE NOTE: We DO NOT accept PayPal, only VISA and MASTERCARD. 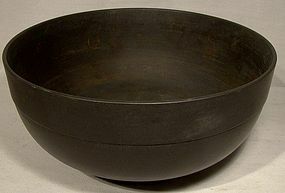 A genuine Georgian black basalt 6-1/4" across and 2-3/4" high bowl by Wedgwood. In the unadorned black basalt matte finish ware, this bowl is stamped WEDGWOOD 6 with a four unit "quote mark" near the edge. 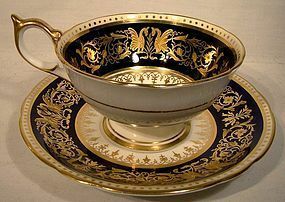 It is simple and Georgian in style, with a 7/8" collar and a fine foot rim. This item is in excellent condition with no chips, cracks, crazing, losses, damage or repairs other than some rust-coloured discolouration or deposits on the interior. All items are thoroughly and conservatively graded and all condition issues are noted; all items are vintage or antique and may have slight signs of gentle use. Expedited tracked and insured parcel shipping to the U.S. starts at $23 (other spots may vary, air is higher). Items paid with a credit card will be shipped to confirmed addresses only. We do ship internationally. All of our prices are in $US. PLEASE NOTE: We DO NOT accept PayPal, only VISA and MASTERCARD. 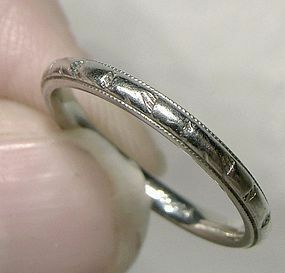 An Art Deco 14k white gold wedding band circa 1920s. This vintage size 6-1/4 or 6.25 ring is stamped 14 K with a makers's mark, and what looks like OPHELIA ROSE (no doubt the name of the jewellery line). 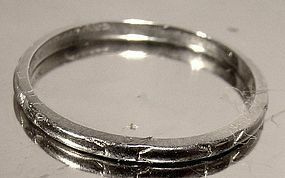 It measures just under 1/16" wide (approximate 1.5mm) and is almost as deep as it is wide, which was fairly common on wedding bands of this style and age. It weighs 1.1 grams and has a simple and slightly worn engraved pattern. It is in very good vintage condition with no dents, bends, corrosion, losses, damage or repairs. All items are thoroughly and conservatively graded and all condition issues are noted; all items are vintage or antique and may have slight signs of gentle use. Expedited tracked insured air shipping to the U.S. starts at $19 (other spots may vary). Items paid with a credit card will be shipped to confirmed addresses only. We do ship internationally. All of our prices are in $US. PLEASE NOTE: We DO NOT ACCEPT PayPal, only VISA and MASTERCARD.